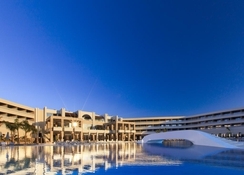 The five-star Princess Andriana Resort & Spa, a popular all-inclusive resort on Rhodes Island, overlooks Kiotari Beach and is perfect for couple and family holidays. Soak up the sun on the luxury hotel’s private Blue Flag beach and order snacks from the Coral Beach Bar. Its charming 380 rooms and suites overlook a picture-perfect Greek island and the blue waters of the Aegean Sea, with the beach steps away from wherever you may be at the hotel. There are several private pools for you to soak in at this luxury resort. There are a variety of cuisines to sample at its five bars and four restaurants onsite, besides the Euphoria Spa that is sure to make sure to de-stress you with therapeutic massages, the Turkish bath and beauty therapies. For the little ones, there’s a mini club that makes sure they stay entertained, along with an animation team. For more beaches, head to Kiotari Beach, about 3 km from the resort or drive down 15 km to Pefkos Beach. You can play several sports at the hotel or enjoy watersports. 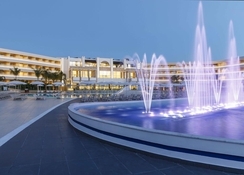 Princess Andriana Resort & Spa hosts a private beach 150 m from the property and is 3.1 km from Kiotari Beach, 15 km of Pefkos Beach and Vlycha Beach. The iconic sights of St. Pauls Bay and Acropolis of Lindos are also about 15 km away. Choose from 380 deluxe rooms, honeymoon rooms, family rooms, junior suites, superior suites and executive suites. The rooms and suites are modern and spacious, with access to private or sharing pools, sea views or garden views. Enjoy an American buffet breakfast at Medallion Restaurant, while digging into Mediterranean flavours at the Moonlight Restaurant. There’s also an all-day bar-restaurant, besides a beach snack and bar restaurant. The hotel’s best feature is that it hosts a private Blue Flag beach, steps away from your room. Once there, there are a lot of watersports for you to take up. There are indoor and outdoor pools where you can enjoy a swim or lounge on sunbeds. If you like sports, join a game of tennis, football, water polo, archery, mini-golf, boccia and table tennis. The Euphoria Spa also has a fitness centre that’s open all day long. 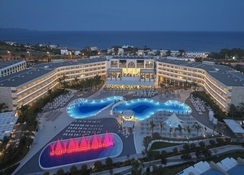 In the evenings, look forward to live entertainment, animation and Greek theme nights. Pets are not allowed (service animals are welcome). (All drinks in Moonlight VIP Lounge come at extra cost). The use of the spa centre and the fitness room is not allowed to guests under 16 years old. Lovely staff and lovely hotel. Had an issue with bar staff not having plastic cups for outside so made a compliant was dealt with extremely well and was given a complentary bottle of wine. Great hotel would definitely go back. We had a fabulous week at this hotel. It was clean, the staff where friendly and the food was great. Was brilliant having a bar on the beach, perfect for us with the kids when they wanted drinks, ice creams and food. The best part was the kids entertainment everynight the kids club staff put 110% into the kids disco and games. We used the kids club a few times during the day and it was just as brilliant! The only down side was it was very slippery around the pool. I'm surprised there wasn't lots of accidents. Amazing holiday in every way. Staff could not do enough for you. Food was highest quality & great variety on offer. Can't fault this resort, they exceeded our expectations and it was my best holiday to date. I am not one to visit the same destination twice but I will definitely go to this resort again. The staff treated you like family, everything was clean, the restaurant was beautiful, food was great and the activities on site were so good especially archery and rifle shooting and the guys who ran the activities were exceptional amazing service would love to go back! We had brilliant time when we went. Rooms were clean. Food was good. The hotel staff were helpful. All round brilliant stay. Excellent welcome & catered for our dietary requirements (vegan) everyday. Excellent facilities for babies and toddlers with many activities and a disco daily. A great hotel with even greater staff, all of whom seemed keen to ensure your stay was the most enjoyable experience. This from the reception down to the cleaners, pool attendants and entertainment staff. A big thanks. Such 5* quality, staff all lovely, was very sceptical regarding the kids club, but all safe and my kids loved it which gave me and my partner time alone which was nice. Entertainment was entertaining most nights, the animation team work so hard, the water aerobics is fun especially if your on holiday with your friends, as its a lot of fun. Family rooms are great you have the sliding doors for a bit of privacy. We will definitely be going back again, hopefully next year August, as the last two times was in May which was still very warm.